1870. Alfred Nobel chose Ardeer, in Ayreshire, as the location of what was to become the largest explosives factory in the world. It primarily manufactured nitroglycerin, for the production of dynamite. Absolutely essential to the process was the one legged stool. This innovation of Nobel's prevented the operator of the nitroglycerin reaction vat from falling asleep on the job. His job was to ensure an exothermic runaway of the reaction didn't take place. "The surroundings are rather trying to sensitive nerves - your life depends, at every moment, upon a thermometer and a man on a one legged stool. Great is the thermometer at Ardeer! Nitroglycerin, a teaspoonful of which would blow you to fragments, surrounds you in hundreds and thousands of gallons. It is making itself in huge tanks, gurgling merrily along open leaden gutters, falling ten feet in brown waterfalls, so to speak, into tanks of soda solution, and bubbling so furiously in other cylinders, through the in-rush of cold air from below, that it seems to be boiling. It is being draw off from large porcelain taps like ale, poured into boxes, and rattled along tramways - all these processes proceeding as rapidly as if it were ordinary olive-oil instead of the deadliest explosive known to man. The product would suffice, if it were to explode, to cut you off in the beauty of your youth. Death instantaneous and pulverizing, encircles you, in fact, by the ton; but the man and the thermometer surround you also. The man’s eyes never leaves the instrument. From the top of one of the Nitroglycerin hills the factory looks like an enormous and eccentric landscape garden. In every direction rise green embankments, square, conical, or diamond-shaped, from fourteen to seventy feet in height, and covered with long rank grass. Many of them are faced with corrugated iron, and look like high fences. From the top of each mound peeps the red canvas roof of a white wooden house – a house within a hill – which is from one to four stories in height. Every explosive structure is surrounded by artificial banks, so that in the event of an accident all the others will be protected from concussion or flying fragments. There are three nitroglycerin hills; and on the one before you the nitrating-house, two in number, in which the nitroglycerin is made, stand out in clear relief at the top. They are frail wooden cabins, which were expected by Mr Nobel when he built them to last six months, but which have not yet been blown to pieces after twenty-five years of constant use. Tunnels through the banks open everywhere. Tramways and lines of pipes on trestles cross each other diversely. This is the "Danger Area," the wide expanse in which the explosives are made and moved about. It is surrounded in an irregular semicircle by fourteen large groups of structures, from which rise fourteen large chimney-stacks. Into this kingdom of high explosives you enter. The strain upon your nerves begins mildly. Your hair is quite ready to rise, so ready that you can feel it awake and stretch itself at every spot of grease which may be nitroglycerin - and every stray pinch of cotton - which may be gun-cotton. You now understand for the first time the psychological condition of a shying horse. You go along just as the horse does, with eyes strained at every small object and a lurking predisposition to bolt. The acid-works are soothing, however. They are quite safe. Nitroglycerin is made from glycerin, the sweetish adjunct of the dressing table, and nitric acid. The glycerin is bought by hundreds of tons from various sources. In this big barn which you enter the nitric acid is manufactured. In two rows stand fifty-eight steel retorts about six feet in diameter and four feet deep, which are bricked up like ovens. Here sulphuric acid, or oil of vitriol, from Glasgow is combined with nitrate of soda from Chili, and the nitric acid thus set free passes over in the pipes to a high framework carrying numberless brown earthenware jars in which it condenses. As it passes over it gives off red – dish fumes which are suffocating - a whiff of them gives you a fit of coughing, and a full breath of them would choke a locomotive. The nitric acid thus made is mixed with a larger quantity of sulphuric acid, and removed in steel pony-cars to a station at the foot of each nitroglycerin hill. Thence the acids are drawn up by cable or blown up through pipes to a tank at the top of the hill by compressed air. You mentally compare the advantages of being blown up with compressed air to be blown up by other means, and smoothing down your hair, enter the Danger Area. To enter the "Danger Area" you must pass the searcher. He stands in front of his cabin, and you will find one of him always blocking the way at the four entrances to the explosive district. He is a tall, military-looking man in a blue uniform faced with red, and he takes from you all metallic objects - your watch, money, penknife, scarf-pin, match-case, matches and keys. None of these are allowed to be where nitroglycerin is. Having passed the searcher, you mount the hill, an artificial one built of sand, and perhaps sixty feet high. On the top of it are two "nitrating houses." They are of thin clapboards painted white, and are about twenty feet square. These houses are always placed on the tops of hills, in order that the nitroglycerin, passing from process to process, may flow by its own weight downward. It is not exactly the kind of liquid that one wants to pump. At the door of the house you are confronted by two pairs of yawning rubber shoes. Large shoes of rubber, indeed, and sometimes even larger ones of leather confront you at the door of every danger house. No shoe which touches the ground outside is allowed to touch the floor of a danger department. The least grit might make friction and lead to an explosion. In all departments the girls are compelled to change to slippers or work barefooted, the majority, in summer, preferring the latter. Having stepped into the overshoes, you begin to flop like a great auk over the sheet-lead which covers the floor. The shoes are trying, particularly as you have other things to worry you. Snow-shoes, ski, and stilts can all be practiced on with advantage before endeavoring to get about in a pair of overshoes which do not fit your own shoes and are ceaselessly trying to trip you up. As you enter the nitrating-house your eye is caught by two lead cylinders, five feet in diameter and six feet deep, which are sunk in the floor. They have closed, dome-shaped tops, over which many lead pipes curl and into which enter. At the farthest cylinder sits a man in scarlet watching a thermometer. He neither moves, looks up, nor betrays any sign of your presence. The thermometer which he is watching is five feet in length. Only the top or marked portion extends above the cylinder, the tube which carries the mercury reaching down to the hot acids and nitroglycerin. In the cylinder has been has been placed about a ton and a half of sulphuric acid mixed with a ton of nitric. Into this mixture are now being sprayed 700 pounds of glycerin, the glycerin injector-pipe being joined by another carrying compressed air. As fast as the glycerin spray enters the mixture it seizes the nitrogen of the nitric acid and combines to nitroglycerin, and the sulphuric takes up the water which is thus set free. The process requires fifty-five minutes, during which the 700 pounds of glycerin becomes about 1,500 of nitroglycerin. Great heat is caused by the chemical action, and the absolute necessity is that the heat shall be kept down or it will explode the newly formed nitroglycerin. 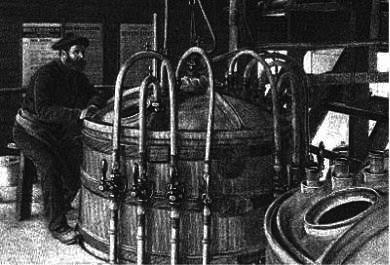 To this end the cylinder is surrounded by a water-jacket, through which cold water is rushing constantly, and four concentric coils of lead pipe occupy the interior of the cylinder, carrying four steady rushes of cold water. If the heat, through vagaries in the glycerin, rose above the danger point, the thermometer would instantly reveal this to the man on watch. If the thermometer rose ever so little above twenty-two degrees centigrade, the man would turn on more air and shut off the inflow of glycerin. If it continued to rise slowly and he could not stop it by more air and water, he would give a warning shout, "Stand by," to a man watching below. If it continued, he would shout "Let her go," and the man would open a valve; this would sweep the whole charge down to the "drowning-tank" lower down the hill, which would drown the coming explosion in excess of water. The two men the meanwhile would bolt to a safe position behind banks. If the heat rose rapidly, too rapidly for "drowning," the man would pull the valve, give a warning shout and run. So would everybody, you included. You might run on one side to the protecting arms of a dynamite magazine holding twenty tons, or on the other to the soothing shelter of a house where gun-cotton is baking at 120 degrees Fahrenheit. Failing these, there is the pond. This is a sweet placid pond which is formally blown up once a week because some dregs of nitroglycerin have drained into it and collected at the bottom, making it unsafe. It is comforting to feel, in the hour of danger, that you have havens of perfect security such as these. The glycerin having duly become nitroglycerin, you flop down the stairs to another department, to witness separation from the acids with which it is now mixed. It comes shooting down a lead gutter, and falls, a cream-coloured stream, to the bottom of a lead tank, eight feet in length and two in width. As soon as the tank is full, the nitroglycerin, lighter than the acid, rises to the surface like oil. It is skimmed off in an aluminium skimmer resembling a tin wash-hand basin with a handle, and is poured into a lead pocket at the end, whence it flows through pipes to a tank, where it receives its first washing with cold water. Thence it goes gutters further down to another department, where it is washed with warm water and carbonate soda. 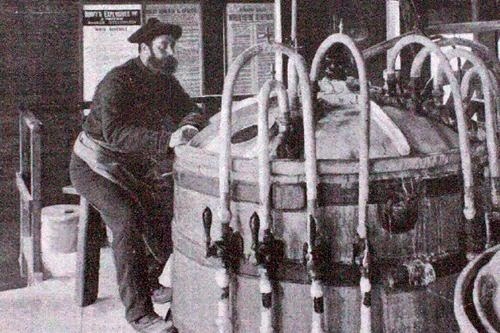 Every particle of free acid must be removed, as remnants of it might cause chemical action, heat, and explosion in the dynamite or blasting gelatin later on. A sample is taken of each lot of nitroglycerin when mad. This is placed in a small clear glass bottle and covered with blue litmus solution, to detect the presence of any remaining free acid, which would colour the litmus red. En passant, your guide mentions that some years ago one of the foremen was carrying a little felt-lined box of theses samples to one of the sample magazines when he unfortunately stumbled and fell. He was blown to pieces. You have now reached the bottom of the hill (all nitroglycerin factories are called hills) and are in a wooden cabin, with a floor of loose sand, where the making of dynamite and blasting gelatin actually begins."